Who are Fashionistas? They're people who follow trends in the fashion industry obsessively and strive continually to adopt the latest fashions. Since Fosjoas self-balancing electric unicycle were rolled out by Moben Intl Co., Limited, they have caught a lot attention. Fosjoas intelligent scooters are advanced vehicles in today's society. And the smooth curved appearance and great performance help Fosjoas electric unicycles become the must-have accessories of fashionistas. All Fosjoas electric unicycles are equipped with build-in smart chips. The chips have aerospace attitude control theory, fuzzy software algorithm and gyroscope system to realize self-balancing. The users just need to lean slightly forward or backward, the unicycle will move forward, speed up, move backward or slow down. Turning left or right depends on the twisting of users' bodies. Isn't it so cool for young people to control Fosjoas unicycles without hands? As a result, Fosjoas self-balancing electric unicycles are easy and interesting to learn. What's more, Fosjoas one-wheel electric unicycle are eco-friendly vehicles. They are driven by the green energy, electricity. So they don't cause environmental pollutions. Fosjoas unicycles adopted the original Sony/Panasonic lithium batteries, which are greener and safer than ordinary ones. It only takes about 90 minutes to reach the full charge. When Fosjoas designed the structure of the unicycles, the industrial designers have saved a lot of space for the batteries with large capacity. So, owing to the power-saving circuit and system optimization, Fosjoas unicycles have longer range. Besides, the world's leading and high-end original motors are applied to the unicycles. They provide Fosjoas unicycles with stable and continuous power. 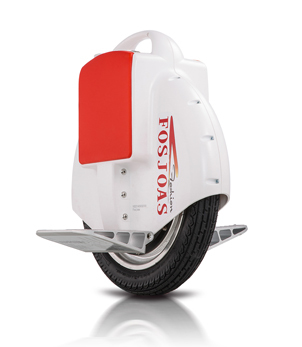 Last but not least, since one Fosjoas self-balancing unicycle weighs only 9.8KG, another character is the portability. Although the unicycle is light, its maximum carrying capacity is 120KG. So users have no need to worry about Fosjoas unicycles' performance any more. If users go out with Fosjoas electric unicycles, when they feel tired, they can stop anywhere and hold the unicycles on hand. They can also be users' beautiful accessories.